Arduino have announced another micro-controller board based on a new ATmega32u4, this processor also takes care of the serial communications with the host PC negating the need for a separate serial to USB chip. A micro USB connector. At last! The SPI bus on the ISP connector no-longer uses any IO pins. The device will act as a USB keyboard or mouse to the host PC. The board is available with or without the headers, without being slightly cheaper. I looked at some UK suppliers but they were not showing availability until the 11th of June so it might be worth getting your pre-orders in now. 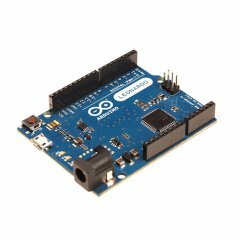 Also there is an update to the Arduino IDE available, this adds support for the Leonardo as well as multiple language support as well as other changes. Today I came across a news article on Engadget about a new development that promises to allow you to connect almost anything that uses electronics to the internet and to each other. 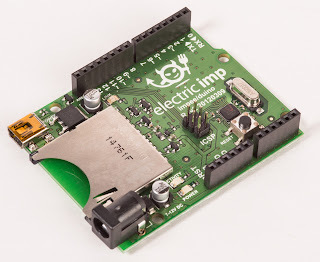 It's called the Electric IMP and it's essentially an ARM Cortex M3 and WiFi built into an SD card space envelope, it looks exactly like and SD card, it even has the same contacts. To set up the WiFi connection there's an app for both the Iphone and Android devices which takes the setup information for your Wifi and then transmits them to the Imp by flashing the screen on and off, the Imp reads this data through the front of the card and sets up the WiFi. Once connected the code, written in Squirrel, is edited in your browser, on their server (I think) and downloaded into the Imp via the WiFi connection. The other interesting aspect is that they provide a service on their servers which allows you to connect your Imps together visually, using blocks, and writing code to interconnect them across the Internet so they can talk to each other. You can also create virtual Imps that are used to connect to Internet services outside the Imp servers, I assume that you could set up a virtual Imp to wait for a tweet from you to switch on the lounge light and that would then be sent to you real Imp, at home, which would then switch on the light or even monitor the temperature at home with an Imp and get a virtual Imp to send you a SMS message when it reaches a certain temperature. The possibilities seem endless. They are showing some development hardware to go with the Imps the most interesting (for me) is the Imp enabled Arduino, the Duino. 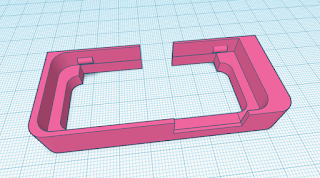 The Dunio seems to be a full standalone Arduino clone with a twist, the twist being an Imp slot instead of the normal USB connector, this means that you write the Arduino code in the Arduin IDE (modified?) 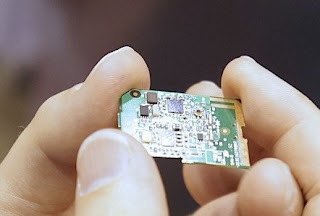 and then send the code to the Duino via the WiFi so your Duino can be anywhere in the world, with a WiFi connection. It's been a while since I purchased the Jeenodes, the original intention was to get them talking to each other using the wireless tranceivers and the graphics display board to dosplay the received temperatures. Anyway, life happens and I got distracted and they were put in a drawer .... time went by and I got interested again. 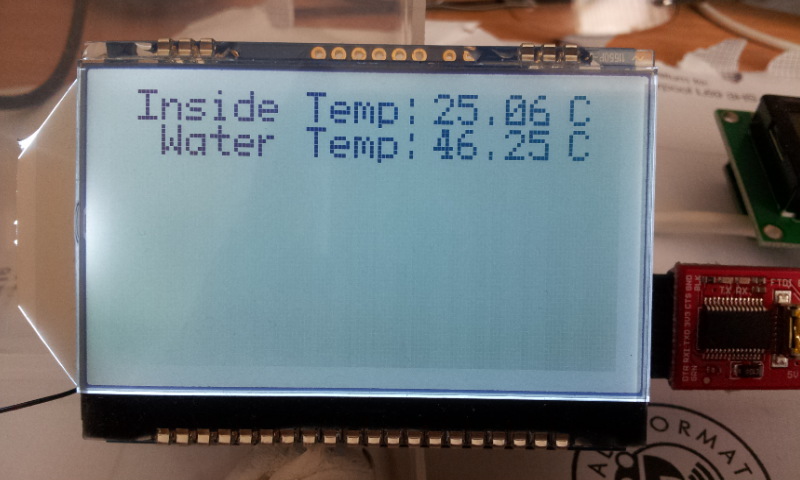 So I've now managed to get the Graphical LCD (GLCD) working and displaying the temperatures and other data from the remote transmitter. 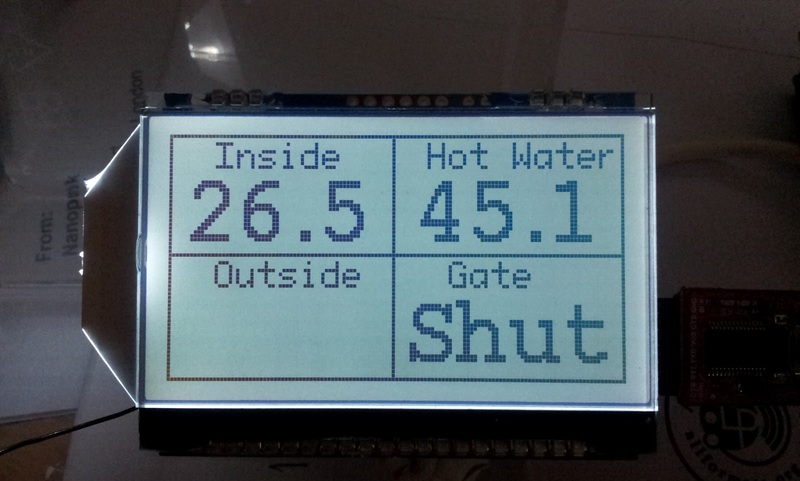 The plan is to have a Jeenode mounted in a waterproof box outside, monitoring the outside temperature and also, using a magnetic reed switch, monitoring the status of the side gate. 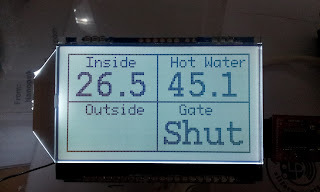 So far I've managed to get a Jeenode sending the data from two DS18B20 digital temperature transmitters once every second, then I was able to get the GLCD from Jeelabs to display the temperatures in a normal font. I decided that the fonts need to be a bit bigger, so it could be easily read from a short distance, this wasn't as easy as I thought it would be, it requires a lot of thought about how many pixels are required to display the temperature. One disadvantage, albeit a small one, I found with the new library that allowed large fonts was that it didn't clear unused pixels when a new character was drawn over the top of the old one. A quick visit to the Jeelabs help forum soon pointed me in the right direction, you have to draw a white rectangle over the characters just prior to writing the new ones to the screen, I thought this was a bit of a pain but in reality it's quite simple to add that line prior to any text you send to the display and it isn't noticeable as flicker. The tricky bit is counting the pixels used in the width across the characters to ensure the rectangle only covers the temp and nothing around it and choosing the font was a bit of trial and error picking the various ones available as I couldn't find a printout of what all the fonts would look like and there are a lot of fonts. Now I've just got to find a suitable box to put it in, sort out a battery and read up on getting the sketch to consume as little power as possible, I'm waiting for the single AA power board to arrive from Jeelabs. I've started using Notepad++ again after a long break from programming my Arduinos and Jeenodes and found that you can use NPP to edit the .ino files and then use the NPPexec script to run the Arduino IDE and load the sketch, then you can just compile and upload. You can add it as a macro by pressing F6 and pasting it into the execute dialog and saving it.